WAKE UP! Shake off Local TV Talking Heads, OK, I always knew that all the mainstream ‘big box’ network news were co-ordinated, and I thought I understood that our friendly community TV newscasts were “salted” with politically correct national and international scripts for Local TV news Talking Heads to parrot, but I just never considered that those “salty” insertions were so blatantly presented as the clever witticisms of our hometown voices of TV authority. OK, OK, OK, I’ve been a little naive in thinking that there was anything local about Local TV, after all they are called Affiliates, aren’t they, and they’re owned by people who own strings of TV stations for making profits, for heaven’s sakes! You’ll see those Local Talking Heads Clone Affiliates’ Telepromptered Scripts in a set of video clips that will make your respect for your neighborhood talents evaporate. These pretty people are good at smiling, memorizing, and regurgitating from their play manuscripts in such an appealing way that you actually might believe they have a care about the information they’re parroting. […]The day had a trending hashtag on twitter — #HappyDay — and its own website. DayofHappiness.net is led by Action for Happiness, an 80,000-member movement to promote happiness, and Cheers, a positivity and happiness app founded in Los Angeles. There was even a Hackathon for Happiness. The H(app)athon Project had people in New York, Indianapolis, San Francisco, Bogota, Tokyo, London and Oslo using the latest marketing technology to try and shift the world’s view of value away from gross domestic product. “We want to create a personal happiness indicator that can teach people: You are worth more than money.” says John Havens, founder of the H(app)athon Project. […]Now why would the UN make a matter as private and subjective as happiness into a public and global one? And, why on 20 March? As with many a good fairy tale, the whole thing started with a king wanting the best for his country. 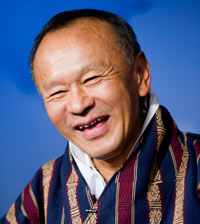 In 1972 the king of Bhutan, a tiny and poor, yet happy Himalayan kingdom, grew tired of countries being measured by its gross domestic product solely, and coined the term Gross National Happiness (GNH). The UN and Happiness plan for we in the developed world is to mentally prepare us to embrace “a very low GDP per capita” such as “Bhutan, a tiny and poor, yet happy Himalayan kingdom”. UN Agenda 21 wants an equally poor communitarian planet of nations going backward together into a “poor, yet happy” United Nations run world. Comments from an attendee on of the April 23-25, 2012, Stockholm+40 by Alan AtKisson author of books, Believing Cassandra and The Sustainability Transformation, can be found on his blog; Alan Atkisson http://alanatkisson.wordpress.com/ . All of the above entities are being taken over from the peoples they represent by those who want UN Agenda 21 to level and standardize the all nations into an equality of poverty and dependence upon those few 0.000001% who have formulated this definition of “Happiness”. Central banks and global corporations own the UN, they ARE the UN (just one example, remember the $10 billion dollars that Ted Turner donated to the UN? ), and they are guilty of causing the lion’s share of, ” “The economic crisis, accelerating environmental degradation and growing discontent around the world” that is being blamed upon the 99.999999% of humanity who have been lead into this moment of growing global MISERY. If the UN Agenda 21 achieves its “Happiness” goals there will be MISERY as never before experienced upon this world…..but………I cannot imagine that this insanity could ever be pulled off, yes, some of it has already been begun…….but really……….you can fool some of the people some of the time………..No, I think UN Agenda 21 will go down as another Utopian nightmare, it’s just too unnatural, never gonna stamp out life and light.